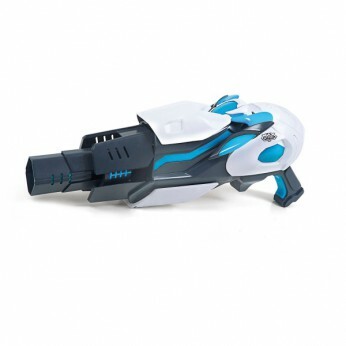 The Max Steel Turbo Blaster is an amazing original design turbo blaster from the hit TV series, your little one will enjoy hours of creative role-play and fun! 3 different positions, each with its own lights and sounds. Attach Steel and see the power increase; One supplied; Size H20, W12, D47cm; Batteries required: 2 x AA (not included). For ages 3 years and over; EAN: 8421134021006. WARNING(S): Not suitable for children under 3 years old. Only for domestic use. Just like the turbo blaster Max users in his adventures. 3 different positions each one with its own lights and sounds. After attaching Steel the noises become louder and power increases. Fantastic toy.Requires 2 x AA batteries (not included). This toy costs approximately £34.99 (for the latest and best prices make sure you check our retailer list for the Max Steel Turbo Blaster above). In our review of Max Steel Turbo Blaster we classed it as being suitable for ages 6 years, 7 years, 8 years but recommend you check the manufacturer specific advice before purchasing.